This Sunday, October 31, we will be playing as a mysterious 60's band...who could it be? 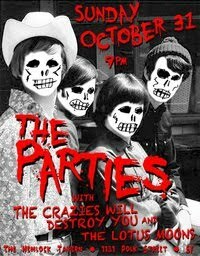 We'll be joined by the fabulous Lotus Moons and The Crazies Will Destroy You. This is the first event of three to celebrate and promote our new Rainbow Quartz release "Coast Garde". As an added bonus, if you show up to all three shows this week you'll receive a free copy of the new record!!! Nov 7 - Lennypalooza @ Starry Plough, Berkeley ALL AGES!! !